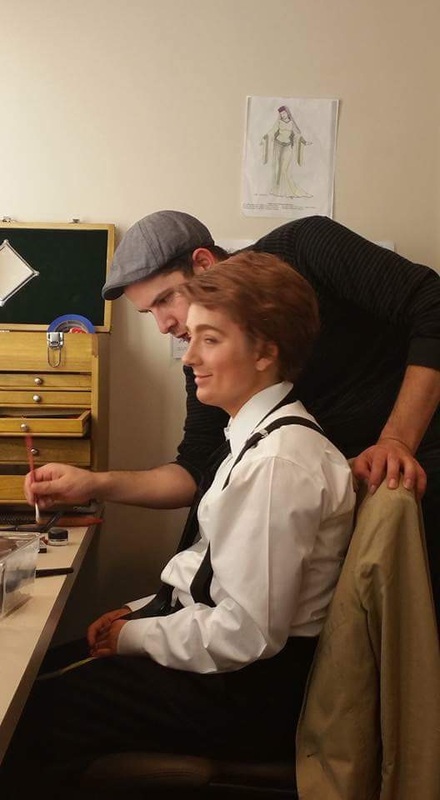 I recently had the life-changing and incredibly fun experience of playing an aggressive nineteen-year-old boy in our opera, Le nozze di Figaro. Cherubino has been such a joy to me, and playing this character freed me to be myself in all areas of my life. During the process of preparing this role and this show, I learned a lot about myself that I didn't know was there. It's so freeing to come into yourself and meet certain parts of your soul for the first time. I want to share some of that with you -- share the Sara I met in the course of playing someone else. 1. I'm actually really funny. My brother Luke has always been "the funny one" in the family -- or at least, that's how I see it. He's pretty quick on his feet, good at comebacks, and skilled at impressions. He also has the perfect Jim Halpert face whenever anyone says anything ridiculous. Since he's always been kind of a cut-up, and I'm the "serious child," I've never thought I was funny. Until the final dress rehearsal of this show. I was talking to my friend Leslie in the dressing room during the bottom half of Act III, and I told her how I'd always wanted to play ingénue roles: "I have the body type and voice type for it, but I always get cast as the funny characters because I guess I have good comic --" I didn't even finish the sentence: good comic timing. Me? Really? I turned to Leslie, grabbed her arm, and exclaimed, "LESLIE! I'm funny!" She looked at me strangely. "Yes, Sara, you are." It had never occurred to me that I am cast in funny roles because I have good comic timing. That had never factored into any of my thoughts. But two days before my performance of this opera, I learned that I'm funny. I have good timing, and the ability to charm an audience. There's a lot of power in that, and I'm excited to discover that it belongs to me. 2. I have mad game, son. After the show was over, I was approached by a couple of the freshmen girls in my choir. One said to me, "Sara, you are making me feel feelings that I don't know if I should be feeling." Many of my female friends were charmed by my onstage antics as an aggressive nineteen-year-old boy. And that's when I learned: I have some serious game, in my regular, everyday life as Sara. If I didn't, I couldn't bring it to life on the stage. This realization is nothing if not empowering. 3. I learned what I'm capable of. 4. I no longer have the luxury of self-doubt. If I know what I can do -- if I know I can do this crazy thing called opera and do it well -- then I no longer have the luxury of doubting myself. If I know I can do it, I have no room for mistrust in the ability God has given me. It is now my duty to walk into it with confidence. This is hard, y'all -- my modus operandi is self-doubt. But if we can have confidence in what you've been given by God (and we can), then we have no other choice than to walk into that confidence, in freedom and obedience. Things I didn't learn: How to tie a tie. Many thanks go to the men in the cast who tied my tie for me at least three times a show (and had to make it possible for me to take it off, too).